I can’t think of an herb that is so easy to grow and offers color to the garden and multiple healing elements from an antiseptic wash or soak to a fabulous moisturizing cream! 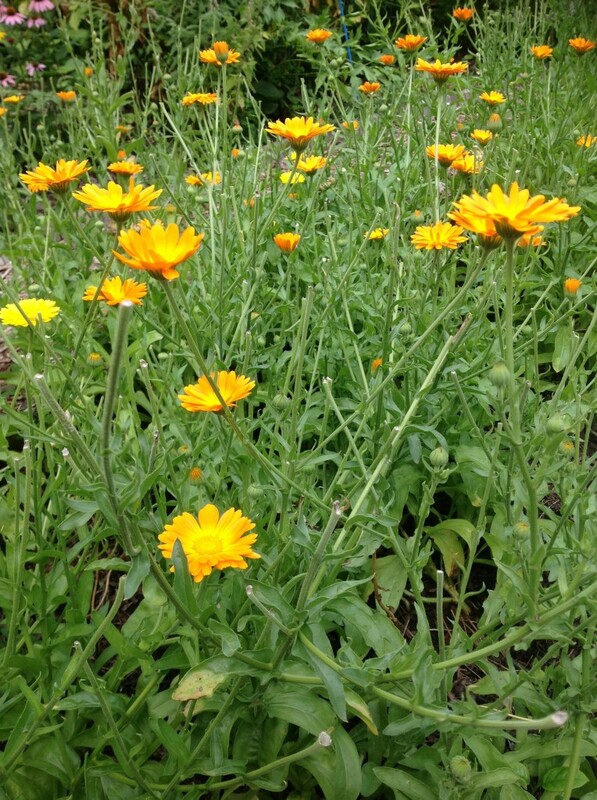 If you ever doubted that you could grow an herb, start with growing Calendula. 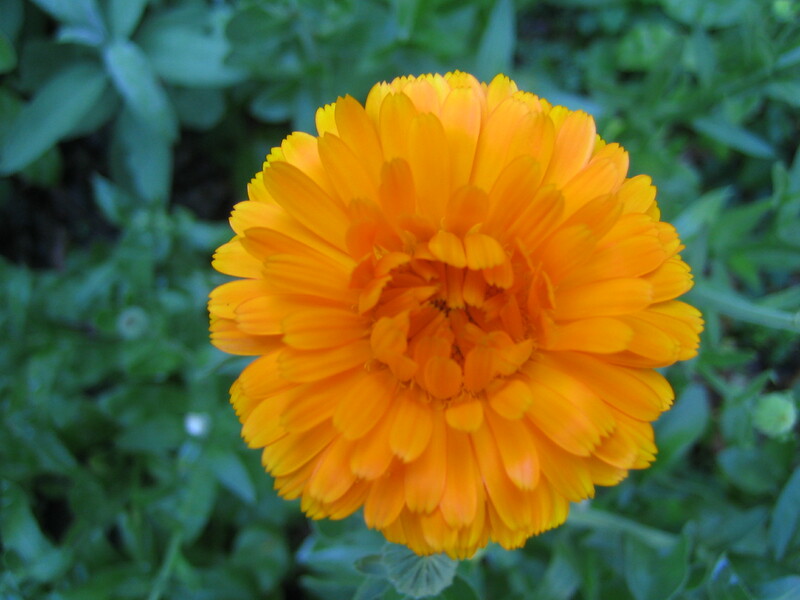 Some authors refer to Calendula officianlis as a marigold. When I first heard this description years ago I wondered if they were talking about the annual Marigold popular along garden edges that also had a strong smell to it. In fact, some folks recommended growing marigolds as a pest deterrent. Bear in mind that Calendula is NOT your garden variety marigold. Once I realized that I went about trying to find the “real” calendula plant. I bought my first seeds from Horizon Herbs, LLC. Calendula flowers are yellow or orange. Both are medicinal. I tend to go for the orange flowered ones because I like that particular dash of color in the herb garden and favor the color intensity of orange. The seeds vary quite a bit in shape and color. 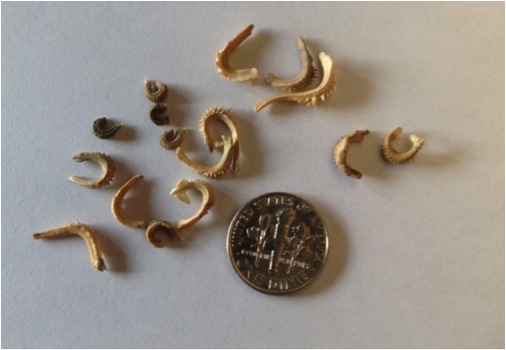 Some seeds are more tightly curved while others are shaped more on the order of crescent moon. One edge of the seed features a ‘spiky’ look. 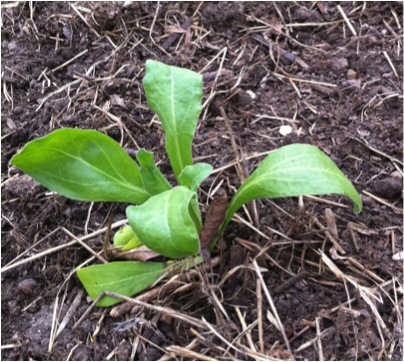 Calendula seedling started indoors and transplanted to the garden. Calendula plants are so easy to start and grow. The seeds germinate readily. Once planted in the garden new seedlings germinate the following year from dropped seeds on dried flower heads. Even though I know the plants reseed, I still enjoy starting a few plants indoors and transplanting them directly into the garden. You could also direct seed in the garden soil. You can’t go wrong no matter what method you choose. Single seedling coming along nicely! 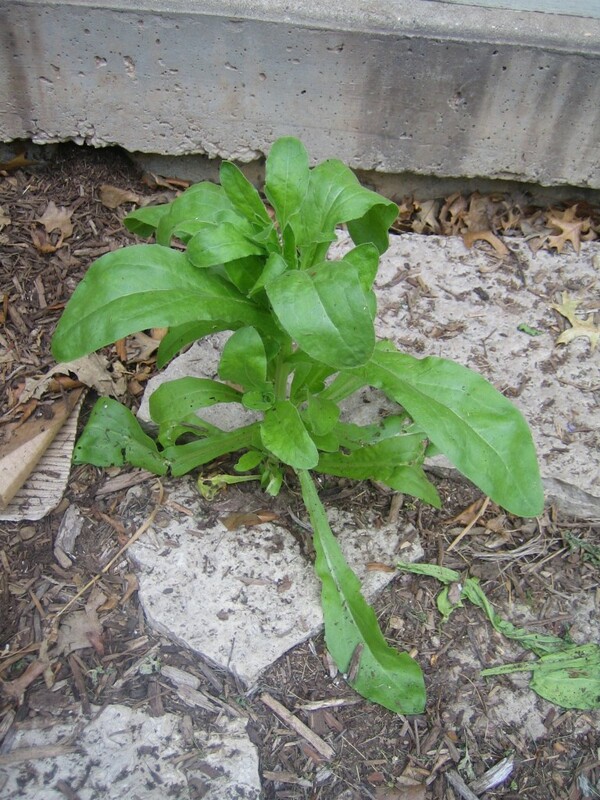 Here is a Calendula plant that took up its home amidst a rock bed by my back porch. It looked so happy I didn’t have the heart or mind to question its choice. I love it when the plants make such a statement. It makes me pay attention and admire them even more. 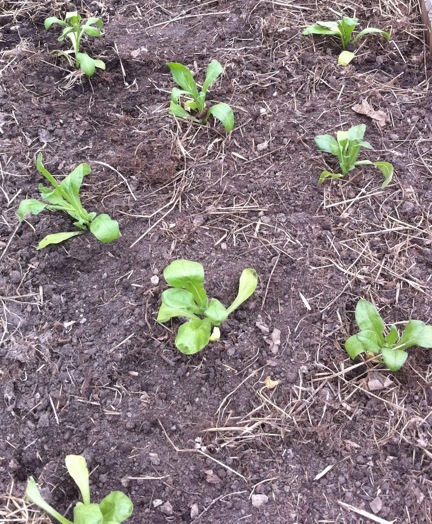 Calendula re-seeding the following spring. Ok, this is what I mean by reseeding. This was a bed dedicated to Calendula. I planted probably fifteen plants here. There are always flowers you don’t harvest in time and they go to seed. Consequently, without any help from you, they provide the perfect means for reseeding and populating the same bed the following year. It’s important, however, to thin the plants out. They will be stunted and produce fewer flowers if you leave them this crowded. The seedlings are perfect size for transplanting and sharing with your friends or putting around the garden for that extra splash of color. I space my plants about 15″ apart. I like to add compost to each hole before planting the seedling. The seedling has a tiny stem near the root ball for holding up the larger leaves in comparison. No worry. Just gently tape the soil around the seedling, let it “flop” a bit and it will strengthen and hold itself upright in no time. Calendula does well in the coolness of spring and fall and even in the heat of summer. I like to think of it as a “three season plant”. And, they prefer full sun. The following photo shows a sample of the chicken wire cages I crafted to place over freshly transplanted individual plants. I use heavy duty wooden skewers to weave a closure and secure the cage to the ground. They work really well. I find rabbits love my garden. I can’t say I blame them. It’s mighty wonderful place to hang out. I believe that we need to share the same space but sometimes they help themselves a little too much to what’s growing! They seem to love Calendula’s tender green leaves in the spring, especially the ones that I grew from seed, hardened-off and transplanted! They don’t seem to bother the plants that reseeded though. Interesting. 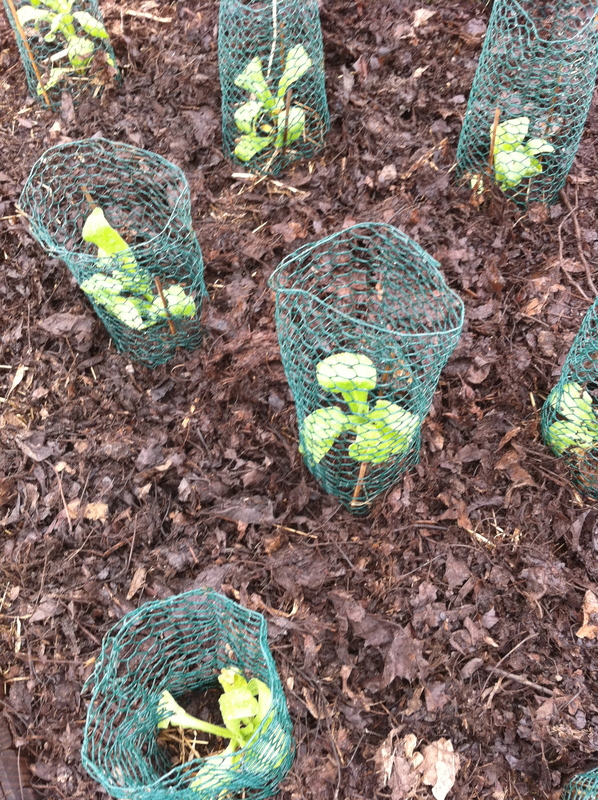 A sampling of young seedlings protected with a chicken wire enclosure. If you’re going to start Calendula indoors and grow under lights, you will need to “harden the young plants off” before setting them out in the direct sun. Hardening off plants simply is giving them gradual exposure to all the elements of an outdoor garden environment with all of the direct sun and wind. So, it’s best to provide some kind of shelter that gives the young seedlings some wind and sun but the full force of them. I use my screened in porch that catches the morning and early afternoon sun light. I like to harden off the seedlings at least two weeks before transplanting them to the garden. Calendula gracing a garden path. 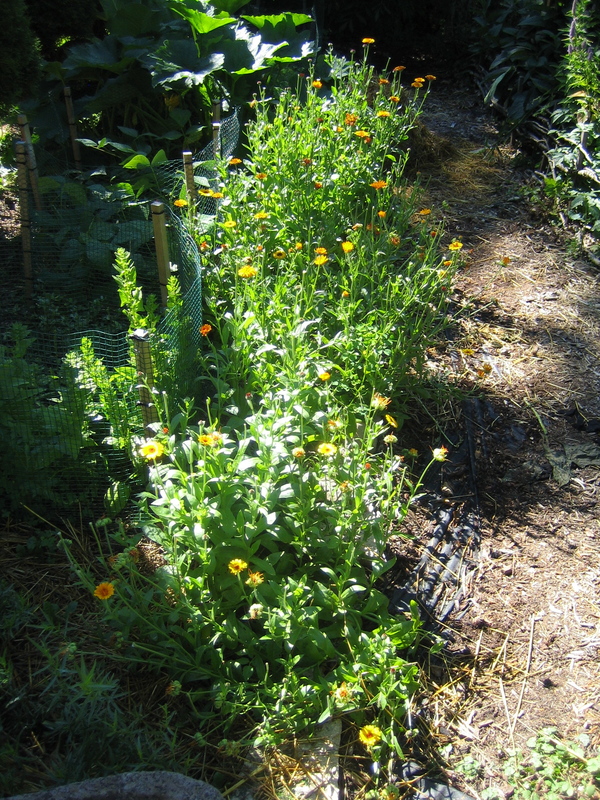 One year I planted a row of Calendula plants along one of the paths in the garden. It made for an inviting walk and easy harvest of flowers. 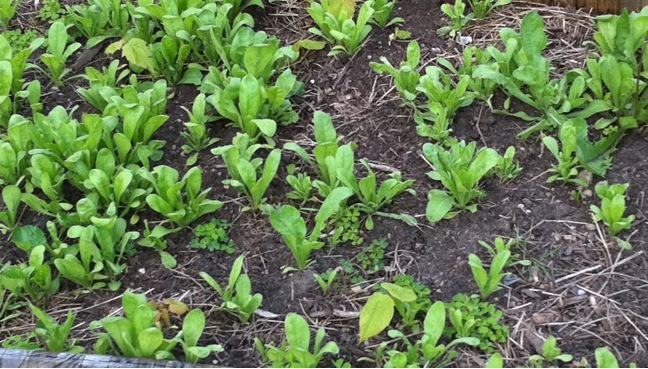 The same bed of Calendula plants featured earlier that demonstrated spacing between plants. Here is that same bed I planted spacing the individual plants about 15″ apart. As you can see the bed fills in beautifully and the plants actually end up supporting one another. Note the single blossom a top a single stem and stems where flowers were already plucked. You can harvest the flowers by simply plucking them easily off the stem. One flower tops one stem. If you don’t want all of the flower-less stems sticking up, just clip the stem back to the main stalk. I haven’t bothered to do that. Flowers vary some from each other. Some flowers have a darker center, some have multiple layers of petals and some even vary in the intensity of orange and yellow. They are wonderful example of a family with unique differences. 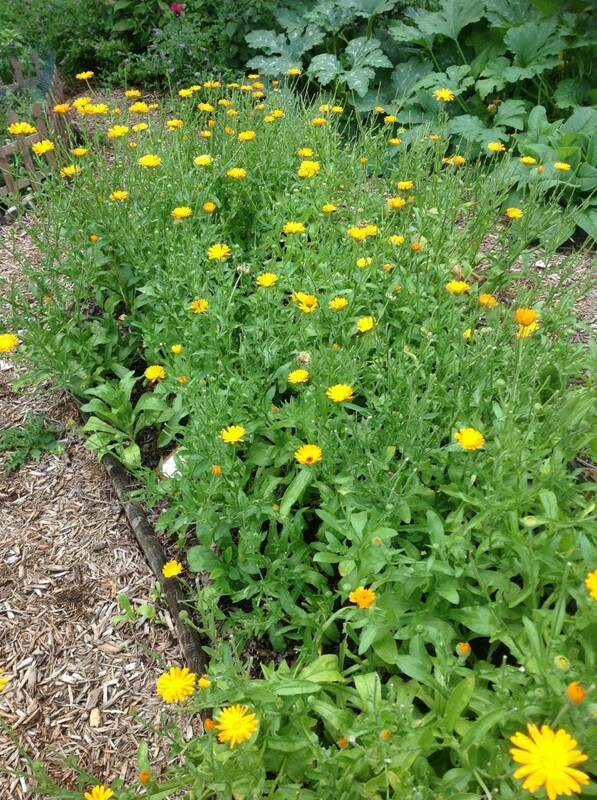 I love growing Calendula. It is such a generous plant. 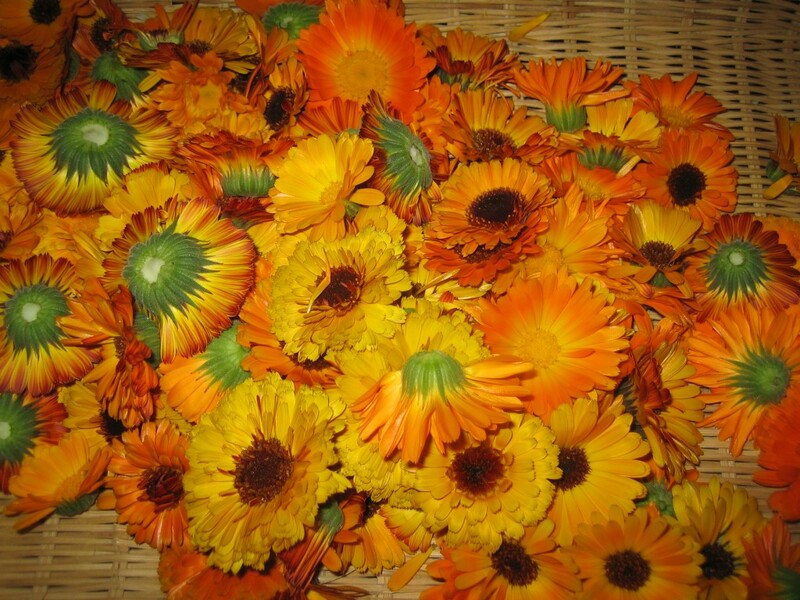 Stay tuned for my next posting about making Calendula herbal preparations. I will also touch on its many medicinal offerings.